Q: What is the core idea behind your book Strategic Learning? A: Strategy has needed to change. It’s needed to evolve so it can it respond effectively to the challenges we face as business leaders today. If we go back in time, it was popular to think about strategy as “how do I go from A to B?” This was a static way of thinking about it. But when we think about today’s fast changing marketplace, we can no longer allow ourselves to think in such static terms. Our real challenge is to create adaptive organizations that are capable, because of their business processes, of generating ongoing renewal, always scanning, interpreting, and responding and never stopping. So strategy has a new job to do for us as leaders. It must provide the tools for us to create and lead adaptive organizations. Q: What do you feel is the key competitive challenge facing established organizations? A: For big established companies, there’s a condition that’s been called the “curse of success.” Such companies often begin to suffer from a particular set of symptoms which leaders must understand and deal with effectively. First of all, their mental models tend to become frozen in place. The belief sets in that they’ve figured out the formula for success. They stop challenging their underlying assumptions and the processes are not there to challenge them. Plus, people that do challenge them are often viewed as being disloyal. They tend also to become inward looking because “large and global” means “complex and difficult” to run. It’s a big challenge for leaders to manage all the moving parts of a business. How do you organize? What should be your selling system? How do you do R & D? Those are very important questions. We can become so preoccupied with them that we become totally inward looking. Then there’s risk aversion that creeps in. We’ve accumulated success, we’ve accumulated resources, profit and cash. Preservation is now a basic instinct. There is a fear of cannibalization. If I do something new then it might cannibalize my existing business. And that’s a deterrent. Of course, the big question is: Will this happen in any event? If it’s going to happen then the only question is: Will I do it to myself or will I have it done unto me by someone else? There’s also a tendency toward incrementalism, a preoccupation with efficiency,and copying competitors, as opposed to innovation. These symptoms can set it. I think the task for us as leaders is to understand that this is a natural tendency, to guard against it, to have robust processes that keep us agile and responsive to the external environment. That’s the challenge. Q: What is the essence of strategy? A: The way to understand strategy is to understand that what gave birth to strategy is the reality of limited resources. No matter who we are, or how large we are, we all have limited resources. That’s the reality. Therefore strategy, is all about making choices. The way that competition expresses itself is in the interaction of choices between competitors. The most intelligent choices well executed will win the game. And intelligent choice making is based on insight rather than guesswork or untested assumptions. And that’s the danger since assumptions drive decisions. The deliverable of a strategy is an intense focus on the right things – the vital few. This is what I call the magic of focus. Strategy as a process should be designed to deliver that outcome for us, without which we cannot lead. Finally, strategy must give us the robust methods for creating alignment throughout the entire organization so that the whole business system, operating holistically as a system, supports the strategy and supports the other elements as well. You then have a complete strategy process. That’s the way to think about strategy – making choices based on insight, deciding where a company will compete, how will it win, and how it will create alignment behind that winning proposition. Q: You speak frequently of the integration of strategy and leadership; please share your point of view on this. A: Strategy is an exercise in the high art of simplicity. Its part of the way we lead. Strategy and leadership are essential parts of each other. A leader cannot lead without a clear and compelling strategy, and a strategy without effective leadership will take you nowhere. This begins to tell us what a strategy should look like. It must win the hearts and minds of everyone in the organization. It’s not enough if it exists only in the mind of the CEO or the senior team. It is essential that a strategy is expressed with simplicity, so everyone can understand it, and that it is supported by stories and metaphors that energize and inspire employees. Q: You also make a clear distinction between strategy and planning. Tell us more. A: One of things that often gets in the way in thinking clearly about strategy is that we tend to lump it together with planning, and use one single process to generate plans and also strategies. We think that if we call it “strategic planning” that just giving it that name will make it strategic. A surprising number of large companies combine this in one process. I call it a toxic mixture. I do so because planning tends to kill strategy and what you end up with if you mix them in one process is 90% planning and 10% strategy. Both are vital. Strategy, which is about making choices, creating focus, defining how you are going to win and establishing alignment of the business system is clearly vital. But so is planning. Planning is a basic discipline – it’s about budgeting, forecasting and logistics. But it is impossible to generate those totally different outputs in a single process. The way to think about the basic differences is this: strategy is about deciding where to lay the railroad tracks. Planning is making the trains run on time. Both of those things are important. You can’t run a railroad without both of those things being in good shape. The key is to separate the two; to have a separate and robust process for each one, and then link them together; and to make the process for each a formal part of the corporate calendar. The golden rule is strategy first, planning afterwards, and link the two seamlessly. Q: You maintain that strategy creation should happen at every level of the organization. What does this look like in practice? A: Yes, strategy creation should happen at every single level of the organization. It really is a cop out if we look at strategy as something that is done at the top and just say to the rest of the organization “your job is to execute.” I say it’s a cop out because what really makes strategy effective is a process of translation so that it cascades down through the organization. All one can hope to do at the top is to establish a broad strategic direction. Then, each line of business needs to establish its own strategies which are aligned with the corporate strategy, its own winning propositions and priorities to create an intense focus on the right things. Each geography in a company has customers with different needs, has different competitors, and different industry dynamics. We win by understanding those things at the local level. Execution happens at the local level, it doesn’t happen at headquarters. Q: A central theme of your work is the notion of “winning on insight.” What are the barriers to winning on insight? A: Insights are a deep understanding of the vital truths that will enable us to make the best choices on where to compete and how to win. The insight game is an intriguing thing because there are some powerful barriers to truth. There are psychological barriers such as the confirmation bias, which is a bias to cling to our preconceived point of view and to seek out selective evidence that will confirm that point of view and to reject any evidence that contradicts it. There are a number of organizational barriers. We organize by department, by function, by business unit, and as a result, create silos. Constructing the total puzzle, is an exercise that doesn’t happen by itself. Each function or department sees only a part of the puzzle. So much of generating insights is connecting dots, seeing the relationships between things, and understanding root causes and ultimate consequences of things below the surface. Then there are political barriers. Depending on who it is that expresses a particular point of view, it will carry a different weight. If a CEO makes a comment on something, it is given a reverential status. It must be true because the boss said it. These things are all in the way, so we need to have robust processes that counter these tendencies and help us understand brutal truths as the way to make choices. If you think about insight in that context, it is winning the battle for insights so that you see it sooner, and you see it better than your competitors do. Being outsmarted by competitors on the insight game is just not a good idea. You’re creating a recipe for failure. Q: Tell us about the process you developed called Strategic Learning. A: At its core, Strategic Learning is a practical learning-based process for creating and implementing breakthrough strategies. Unlike traditional strategy, which aims at producing one-time change. Strategic Learning drives continuous adaptation. Strategic Learning has four linked action steps – learn, focus, align, execute – which build on one another. The first two steps form the basis of a firm’s strategy creation. The third and fourth steps are the foundation of strategy implementation. As a result, strategy creation and implementation are integrated into a mutually reinforcing cycle. It is an insight to action model. 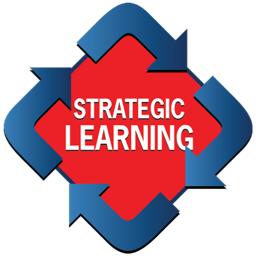 The unique feature of Strategic Learning is that it unifies strategy, learning and leadership in one holistic, mutually reinforcing process that helps organizations adapt promptly and effectively to changes in the competitive environment.